The bottlebrushes (Callistemon) are a genus of trees and shrubs native to Australia, but used as ornamentals in warm climates in the United States and elsewhere. There are between 20 and 40 species. All are evergreen, with aromatic leaves. The nickname "bottlebrush" comes from the fact that the long red stamens of the tiny flowers stand out from the spikes, giving them a brush-like appearance. 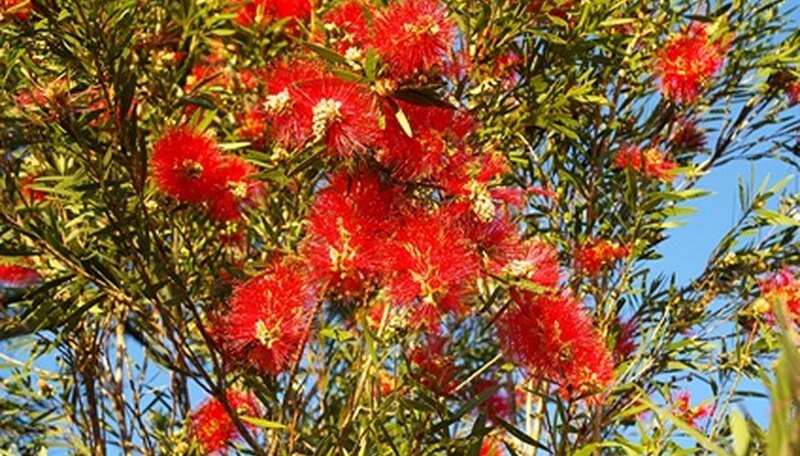 Bottlebrushes are members of the Myrtaceae, or myrtle family, and are related to a number of useful plants, including guavas and the tree that produces the spice clove. The seeds of Callistemon are contained in woody, rounded capsules that may remain on the plant's stems for several years. The capsules are adapted to survive brush fires that are common in parts of the plant's native habitat. These fires, or the death of the plant, cause the seeds to be released through slits in the tops of the capsules. Seeds germinate in 14 to 30 days, depending on the species. Some species, most notably Callistemon citrinus, reach flowering size in about six years. If seeds came from a hybrid variety, the offspring may not resemble the plant from which it came. Young plants sprout evergreen leaves that are often aromatic. The flowers, when they appear, are tiny and either red or yellow, depending on the species. The distinctive stamens appear at the same time. Bloom time for the flowers is spring or summer and occurs over a long period. Pollination is by birds, though the plants are often frequented by bees, geckos and other wildlife. Different Callistemon species growing in proximity of each other will hybridize readily. Depending on the species, Callistemon has a medium-to-fast growth rate and can reach 18 to 25 feet in height. Callistemon citrinus, one of the most commonly grown species, has a growth rate of 36 inches per season and a lifespan of less than 50 years. The flowers appear on the stems below the current year's growth. To hasten the propagation process, seedpods can be collected from bottlebrush trees. After collection, they should be stored in a paper bag and placed in a warm location. The seed pods should open and release the seeds within a few days, at which time the seeds can be sown in a fast-draining soil mix. Though Callistemon only occurs in the wild in Australia, it can be successfully grown outdoors in warm winter climates such as Florida and coastal California. It may also be grown as container specimens in cold winter climates, as long as it is overwintered indoors under cool conditions. Plants can be grown from seed, propagated from semi-mature wood cuttings or grown from potted specimens purchased from nurseries. Young transplanted specimens should be planted in full sun and watered regularly until they are established. They should also be fertilized during the growing season and pruned, if necessary, to control growth. "The Botanical Garden, V1"; Roger Phillips and Martyn Rix; 2002.